In one of our recent blogs, we reviewed some of the benefits of consigning furniture to a consignment store. Consigning your furniture is a great way to put some extra money in your wallet. It can make moving or redecorating your place far less stressful. Plus, it’s more convenient and generally gives the seller more money than when compared to direct selling. With all the benefits of consigning furniture offers, it’s a no-brainer decision. 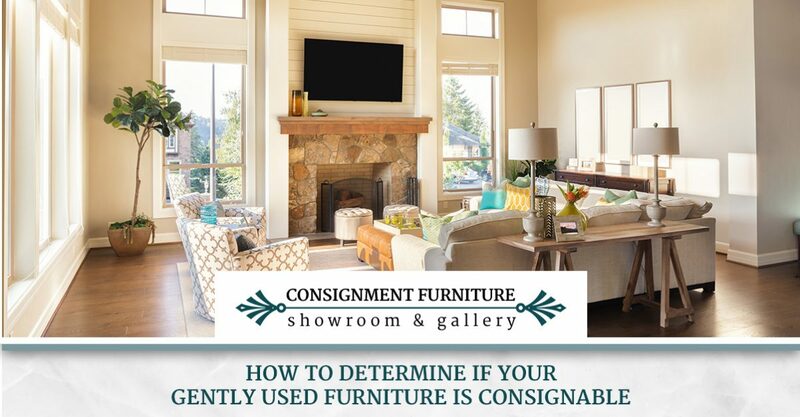 But how do you determine whether or not your furniture pieces are consignable? In this blog, we’ll cover some factors to consider before heading to the nearest consignment store. Want To Sell Your Furniture? See If It Meets Consignment Criteria! If you have ever wondered ‘Where can I sell furniture?’ you may have considered consigning. Consigning furniture has a lot of benefits. However, it is important to first determine if your furniture pieces are consignable. Consignment furniture stores are typically looking for new or gently used furniture. The best way to figure out if your furniture qualifies for consignment is by considering the following criteria. Age plays a significant role in whether or not your furniture is consignable. Most consignment furniture stores are looking for items that are between two and five years old. Some furniture that is around ten years of age — or older —may be considered for consignment based on its condition and market appeal. Queen Anne style furniture, for instance, although it is a little older, if in good condition, it will likely be consignable. A good rule of thumb to follow when consigning is the newer the better. Consignment furniture stores only accept pieces that are clean and in good to excellent condition. Any worn, stained, torn, or faded fabric on a piece of furniture will hurt its chances of being consignable. Wooden furniture should be free of nicks, scratches, gouges, and water rings. One of the benefits of consigning your gently used furniture is that it reaches a broader audience. However, that audience will only be interested in furniture that is appealing and currently in style. Consignment stores are searching for items that are of a popular style color, texture, and finish. Upholstered items. Solid-color sofas, sectionals, and comfortable chairs are in demand. Sleeper sofas are also popular. Leather furniture. Consignment stores are always looking for leather sofas, chairs, and other items. Wooden furniture. Wooden dressers, desks, and bookshelves are highly sought pieces of furniture. Dining sets. Dining tables and chairs, especially contemporary ones, are popular sellers at consignment shops. Sell Gently Used Furniture At Consignment Furniture Showroom! If you have gently used furniture in Pinellas County that you are interested in selling, head to Consignment Furniture Showroom and Gallery. We make the process of consigning furniture easy! Contact us to learn more information contact us or visit one of our two furniture stores!